I am always on the lookout for additional income streams especially when it's online and I can earn it from home. Recently, I have discovered 199jobs.com. This is a website where you sell your services for just 199 PHP. If you are familiar with Fiverr, then this, for me, looks like local version of it. This post is my 199jobs review. I registered to the site and see if I can make some money out of it. Registration is pretty straight forward and if you have an email or a Facebook account, you are good to go. I am a certified online marketing specialist. So, I listed my service as a website auditor under digital marketing category. You can see my service here. On the day my listing was published, I already received my first order. I finished the task within 3 days as promised from my sales copy then notified the buyer and the buyer completed the task on his end. After that, I received my payment of 159 PHP. 199jobs gets 20% of each completed order. That is how they make money. After getting around a worth of 600 PHP completed order, I was able to withdraw the amount to my Paypal account. 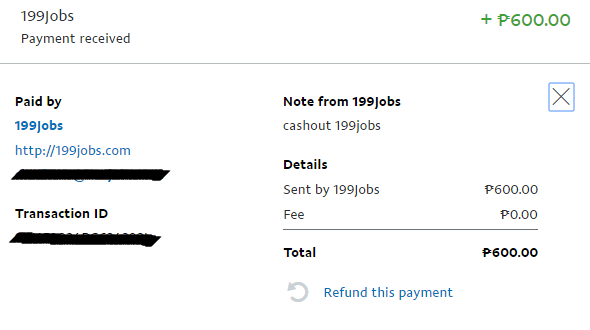 199jobs has a minimum amount of 500 PHP before you can withdraw the money. The company transferred the money within 3 business days. I also tried buying an article writing job from the site and the article was quite good and the delivery was on time. I published it as a blog post to one of my online ventures. I recommend 199jobs.com for those who are looking for additional ways to earn money online in the Philippines. If you have a lot of services to sell, you can make significant amount of money through this site. I think this site has its good side but still I think they do not give a fair payment for writers. Read my article about it http://www.phreview.tech/2016/07/is-199jobs-website-making-mockery-of-writing.html.